The Martingale system seems like it could be profitable. After all, with a large enough bankroll, you are bound to win a race here and there. This is simply not the case. The Martingale system was designed for 50 – 50 propositions. 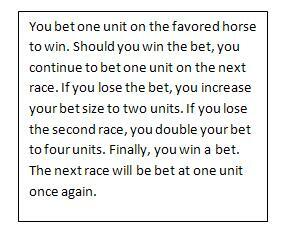 If you are betting on a 4/1 or even a 2/1 horse, you are not getting the proper odds to make the Martingale worthwhile. The other problem with the Martingale is the fact that it has an extremely high risk of ruin. If you are betting $5 units, ten missed races in a row would end up costing you $5,115. Your tenth bet would be $2,560. If you did win on this last bet your net total for the day would equal $5. Is $2,560 really worth $5 of profit to you? The problem is that each race is independent of the last, so there is no guarantee that you will win every tenth race or even every twentieth. The Martingale system is just too risky for betting on horses. Flat betting occurs when you keep your wagering amount the same size bet after bet. This can be a decent strategy, but it does not take into account the proper odds that you are getting on a horse. For example, betting $5 on a 1/1 horse to win is a much different bet than betting on a 9/1 horse. 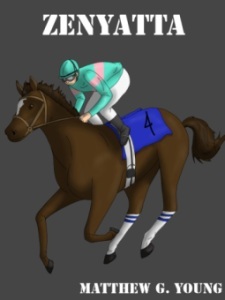 Your odds change with every horse, and if you are not betting the proper amount of your bankroll, according to the Kelly Criterion, you are losing out. So for a $6 bet, you won a total of $6.60, a $0.60 return. You didn’t make a lot of money, but you also didn’t lose a lot. The truth is, is that WPS betting can be a good idea, but only occasionally. Most of the time, your money would be better allocated in other spots, like the exotics. The second place horse in the example above is a good example. You thought that it was a winner, but had a bit of doubt. Instead of WPS betting, you could have paired the horse with the two other speedy contenders in a $1 exacta box. The cost would be the same as a $2 WPS bet: $6. And your returns on a winning exacta would normally be much higher than $0.60. Betting based on limited criteria will not always backfire, but you will lose often enough to make it a detrimental play. This will especially happen with new bettors who make a couple bets and win big. Take myself for example. I bet $3 on a long shot horse when I first started out. The horse came in first at 97/1 odds, giving me almost $300 in winnings. I thought that I was the best horse bettor out there. So I began rushing through my handicapping, not considering all the options and made several ill-advised bets. The $300 I had won did not last long. Learn from my mistake and do not duplicate it. Early luck can be a curse. It is better that you struggle in the beginning so that you are always looking to improve your game. We will cover this more in grade 12. The WPS section touches upon this briefly, but excessive hedging can deeply cut into your profits. The general adage is that if you like a horse, bet it to win, not to place or show. Studies have concluded that this is the most profitable angle to play. One strategy sometimes works is to bet an exotic involving the horse you like, then bet some of the other contenders to win. This type of hedging will prove to be more profitable than WPS hedging. Well, we are almost done with grade school. Our last lesson will consist of tips on how you can further improve your game. We also want to share a site with you that we think will help you if you are interested in fantasy sports. Windailyfantasy.com is a fast growing site looking to help people who like sports, such as horse racing, football, baseball and any other sport. Although different from horse racing, fantasy sports carries some of the same strategies when finding winners.